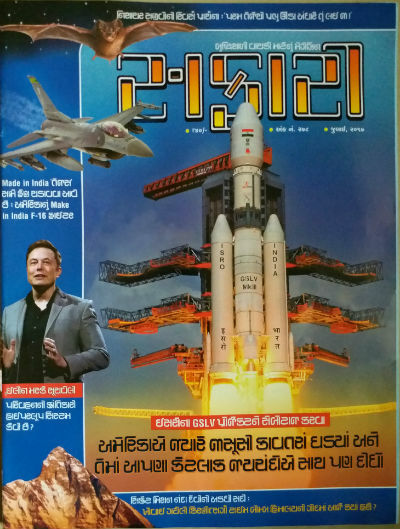 Like every month, we were curious to explore and review the current month issue of Safari Magazine (Gujarati edition). The July 2017 issue of Safari was published quite on time, I, however, got caught in some other stuff so the reviews are coming a little late. Let us start with the cover page of the issue. As you can see the cover page of July 2017 issue is quite attractive. It gives the magazine a look of a science/knowledge magazine and makes is look more authentic in the field. The image of ISRO‘s rocket, ready to initiate the satellite launching, for which it is considered as the best and most economic around the world gives us an idea about the themed article in the issue. The blue and sky blue background makes the cover page attractive and represents the depth of the knowledge. So, we are giving it full marks for the cover page. This is a new segment which seems here to stay in all coming issues. In this segment Sushil Bhatiya brings us information about unique places of India, making it incredible. We suggest you to read more about “Dhala Crater”. The article in the magazine could have been more detailed, but it gives summarize information, pretty effectively. The editor, Harshal Pushkarna is a nationalist and respects the brave soldiers of India (like majority of other citizens), but he moves a step ahead and shows his love and respect to them. He also urges all the readers to acknowlege the love and respect they have for the soldiers. They are (the soldiers) the ones who have sleepless nights, so we can have sound sleep. And we love them, respect them for the stuff they are doing? Many of the civillians have a question in their mind that what they can do for the soldiers or armed forces. Various ways to send them a note of thanks and appriciation and/or give our contribution for them is discussed in the editorial of this issue. It is worth to note that Harshal conducts seminars at various places under a movement named “Siachen Drive”. He does it for free. So if you have a good audience, a projector, and can arrange a place like a hall or auditorium, he, based on his schedules come there to deliver the seminar for free. He conducts a Q/A session at the end. And yes, he distributes hundreds of postcards for free, pre-written with the destination address (to a soldier of Indian armed forces), you simply need to get the postcard, write whatever you want to convey to them (in Hindi or English only), and his team collects the postcard back from you and dispatches them! He shares the addresses in this issue, so you can submit your gesture of appriciation for the Indian Armed Forces on your own also. A not to miss editorial. Currently India’s ISRO (http://www.isro.gov.in/) is considered as the most economic and reliable when it comes to space missions. Be it launching more than a 100 satelites in a go or having economic yet successful MOM (Mars Orbiter Mission); the world knows the capacity of ISRO now. However, the situation was not the same earlier. The countries which were powerful those days and wanted to have their superiority in the space have tried sabotaging plans of ISRO’s earlier missions. How Dr. Vikram Sarabhai, Dr. A. P. J. Abdul Kalam and many other brilliant and nation loving people have made is possible, is worth to read in an article written by Nagendra Vijay. One thing we must say about the writing style of Nagendra Vijay, that, you feel that his longer articles also like smaller and finished earlier, when you wanted more! On one end you will feel proud of ISRO, on the other you feel sad when you heard how the plans of sabotaging ISRO’s mission affected Mr. Nambi Narayanan and his family (and who knows there can be more victims. So far we know handful ways for traveling. That is, by roads, by the sea and by the air and by the railway. Each of them have their pros and cons. Considering time as an important aspect air travel is the fastest and preferred way, but only by the rich fellows. Also when the amount of goods/material you want to transfer is huge, we definitely need to go via sea (in terms of international transport mainly). Roads and Railways are good for domestic travel mainly (with exceptions). What if we can cover the distance in very less time and that too economically? Elon Musk, a visionary who is known for his association with innovative companies like Space X, Tesla Inc., , SolarCity, OpenAPI; shown interest in exploring Hyperloop technology for transportation. The idea is simple yet complicated. Hyperloop One (an Elon Musk Company) is exploring it in its way. India, being a country with more than 1.2 billion people is in need of good and economic transport. And, thus is the best place to test evolving technologies in this field. He proposed a solution for India (which can be implemented in multiple phases). At the same time, Hperloop Transportation Technologies, another company working on the same innovative technology is also interested in exploring it’s test in India. A detailed article about “Hyperloop way of travel” found in this issue is definitely worth reading. Kept as a secret, the details about Mission Nanda Devi didn’t came to limelight ever. The mission have had its target, and we are not going to discuss about it, we leave it for you to explore in a detailed article written by Captain Vijay Kaushik in this issue. Though, it is worth to note that a mishap took away a generator which work on Nuclear energy deep inside Himalaya at some unknown place. The scientists and superior army officials (who were aware with the details) have tried searching it, and especially the symptoms of radiation in the rivers, flowing from those mountains for many years. Why it is so dangerous, and how many more years, we have to live in the fear of any possible tragedy due to this lost gadget, is explained in the article quite effectively. In addition there are regular sections including Q/A segments present in this issue making it rich in the content. It is definitely “worth the money and time” magazine issue. It also gives clear idea about how when you are top, everyone come appeasing you, but the same persons (or entities) could have tried all to not let you achieve it. Anyway, that’s why it is important to look at historical incidents, to learn lessons from the mistakes, to find the background of some incidents happening or predict something to be happened in the future. Safari, writes from best of their team’s knowledge, by trying hard to finding facts, and represents them in interesting, unbiased and neutral manner, which is a “worth appreciation” attribute.